Grando de tiu PNG antaŭprezento de tiu SVGa dosiero: 528 × 600 rastrumeroj. Aliaj distingivoj: 211 × 240 rastrumeroj | 422 × 480 rastrumeroj | 676 × 768 rastrumeroj | 901 × 1 024 rastrumeroj. 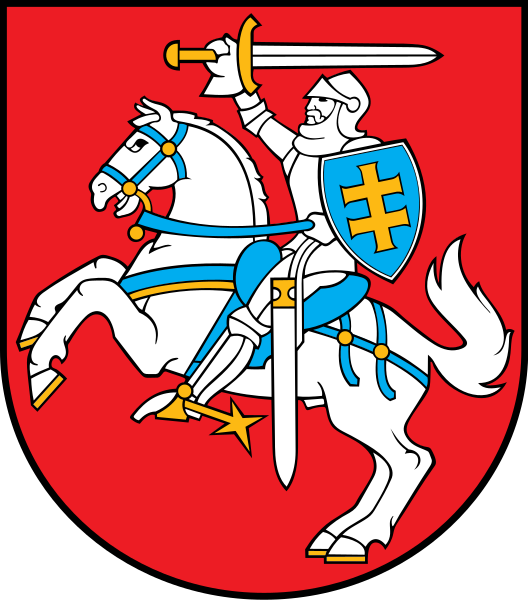 Deutsch: Das litauische Staatswappen "Vytis"
English: The coat of arms of Lithuania, entitled "Vytis". Present day version of the coat of arms of Lithuania. Esperanto: La blazono de Litovio "Vytis"
Português: O brasão de armas da Lituânia, intitulado "Vytis"
Ĉi tiu Blazono estas kreita per Adobe Illustrator. 01:49, 20 feb. 2011 538 × 610 (55 KB) Quibik Added padding around the shield, so no cutting in would appear when downscaling. 16:57, 30 jan. 2010 528 × 600 (55 KB) Froztbyte Corrected blue object to blue. Reduced file size. Improved shield.